All your transactions such as payments, deposits and bank fees are accounted for in QuickBooks. All transactions in your QuickBooks bank register, as well as its ending balance, match what you have in your actual bank account. Set up the bank or credit card account in QuickBooks with the correct beginning balance. Received a copy of your bank or credit card statement. A pencil for marking the selected items on your statement may also be handy. You will come across two main windows as you start and complete the reconciliation process. In this window, you choose the account to reconcile and review information about it including the beginning and ending balance, as well as the statement date. It is important that all information in this window is accurate before you proceed to the next step. To open the Begin Reconciliation window, go to the Banking menu and select Reconcile. In the Account field, enter or select the bank or credit card account you want to reconcile. The Statement Date is automatically filled in. Usually it is 30 or 31 days after the statement date you entered for the previous reconciliation. You can change it as needed. Note: If you will change the date, be reminded that it should always be the ending date of the month you are reconciling. Beginning Balance is automatically filled in. It is the sum of all previously cleared transactions. Check to make sure it is the same as the opening balance shown on your statement. What if the beginning balance is incorrect? The beginning balance will be incorrect if a previously cleared transaction in your register was voided, deleted, or changed, or a new transaction was added and cleared since your last reconciliation. You can run several reports to find reconciliation discrepancies. In the Ending Balance field, enter the ending balance from your statement. If the financial statement shows a service charge or interest that you haven't yet entered into your QuickBooks records, enter those amounts into the Service Charge and Interest Earned section. Important: Don't enter charges you have already entered as QuickBooks transactions. Select the Undo Last Reconciliation button if troubleshooting requires you to revert to the previous reconciliation. If all information is correct, select OK to proceed to the Reconcile window. In this window, you can refine the choices you want to match against your bank statement. This is where you select transactions to clear. If this window shows a zero difference after you select all transactions that appear on your statement, then congratulations! You can simply select the Reconcile button and you’re done reconciling the account. Let’s do a rundown of the options available in this window and what they are for. Account you are reconciling: This indicates the account being reconciled. Once selected, it will provide you with the opportunity to change the information from the Begin Reconciliation window. Search field: Acts as a search engine for the uncleared transactions. You can enter Name, Amount, Account, Date, Check number or Payee as your search keywords. The transactions entered in QuickBooks: These are listed and divided into two sections – the Checks and Payments (Money out) and Deposits and other Credits (Money in). Check the transactions against what you have on your bank or credit card statement. Make sure to select only the ones that appear on your statement. You also have to ensure the amounts are the same. Note that as you select transactions, the Cleared Balance changes. Note: If you are reconciling a credit card account, the sections are Charges and Cash Advances (purchases) and Payments and Credits (payments to the credit card company). Items you have marked cleared: This section displays the total number and the total amount of Deposits and Checks you’ve selected. Some bank provides the same summary of transactions on their statement. Looking at this section will save you time if you need to check for discrepancies. Mark All/Unmark All: Select either of these buttons to select/deselect transactions. If you reconcile on a regular basis and if all transactions for the statement period were entered correctly, selecting all transactions at once may save you time. Just make sure the reconcile window shows a zero difference between the ending balance and cleared balance. Hide transactions after the statement’s end date: Put a checkmark on the box if you want to display only the transactions covered by the statement period you are working on. 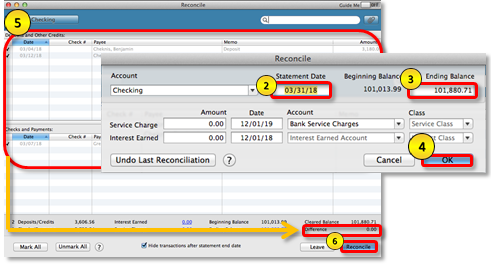 This will help avoid confusion especially if you are “behind” the reconciliation process and there are current transactions already entered in QuickBooks. Leave: Select this button if you need to exit the reconcile window. The items you selected will still be marked when you return to this window. Reconcile Now: Choose this button if you are done selecting all transactions. This section provides you with a glimpse of the reconciliation figures. 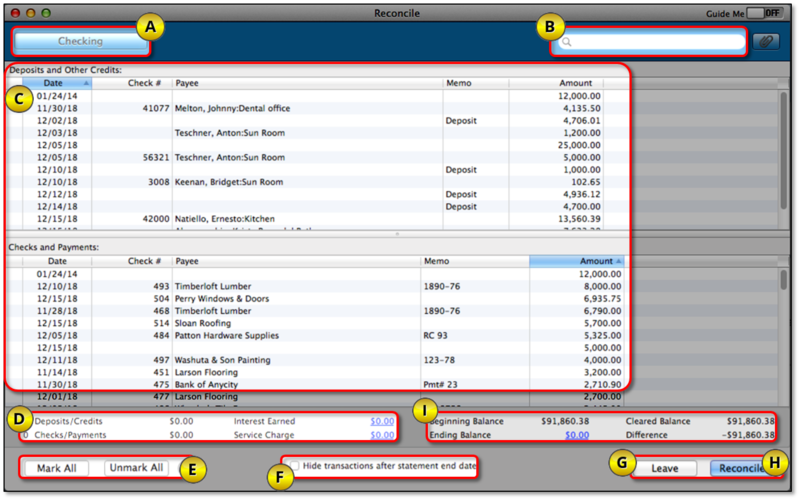 If the difference is zero, QuickBooks saves the reconciliation and displays the Select Reconciliation Report window. Choose the type of report and then select either Display or Print. Choose Close if you do not need any reports at this time. You may go to Reports > Banking > Previous Reconciliation if you need to go back to the report or if you accidentally close it. Return to Reconcile: Choose this to go back to the previous window. Enter Adjustment: Choose this to complete the reconciliation process although you didn’t get a zero difference on the previous window. QuickBooks will automatically enter a Journal Entry under a special expense account called Reconciliation Discrepancies. You can check and edit it as needed by going to your Chart of Accounts. For credit card accounts, if your ending balance is anything but zero, QuickBooks will display the Make Payment window and prompt you to write a check or enter a bill to pay for the outstanding balance. If you do not want to record payment, you can select Cancel. When you troubleshoot issues with bank or credit card accounts, you may need to delete and re-enter transactions and then reconcile them again. To save time and not go through undoing previous reconciliation for each month until you find the transactions causing the discrepancy, you can simply do a special reconciliation. Before proceeding, make sure to find and correct what's causing the beginning balance discrepancy. From the Banking menu, choose Reconcile. In the Statement date field, enter the date of the incorrectly reconciled month. In the Ending balance field, enter the balance plus/minus the difference.If the difference is positive, add it to the beginning balance. If the difference is negative, subtract it to the beginning balance.In the example provided, the beginning balance is $101, 013.99 and the difference is $866.72. If we add this up, our ending balance is $101, 880.71. On the Reconcile screen, put a checkmark on the transactions that were un-reconciled. Make sure the difference is 0.
Review the Previous Reconciliation Detail Reports again. Note that both reports will now show the same data.